First up...New stamp designs from PSA! PSA Essentials produces clear stamps that fit with their self-inking stamp handles, along with a variety of custom dye inks! I've been so enjoying being on the PSA design team and adore this new line of Asian-inspired stsamps...can't wait to get my hands on them so I can start stamping! You can purchase these new sets here! 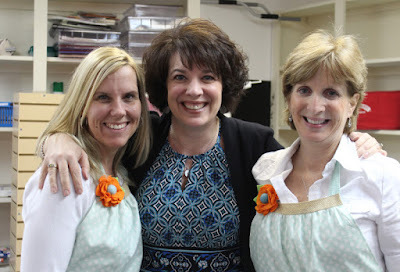 And then I have to gush a bit about meeting Kim Hughes (and her darling friend Caroline) last week when she taught a class at Wholly Scrap! Seriously, she is a delightful instructor and we all had such an amazing time stamping with her line of stamps from Paper Smooches! 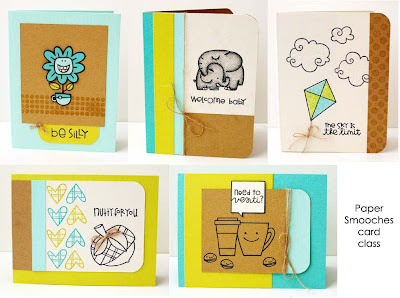 Here are the cards that we created...aren't they so sweet?! And on each card Kim demonstrated a certain technique, such as paper piecing or masking, and provided us with little stamping tips. Great class! Thank you Kim!! If you've never checked out Paper Smooches stamps...head on over to their site asap...you'll love Kim's designs! Enjoy! I'm hosting the Sweet 'n Sassy Hump Day Challenge today on Splitcoast! This week's challenge is to use heat embossing. 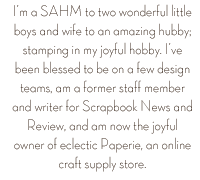 When I first started stamping and discovered embossing, I embossed just about everything!! Oh how exciting it was to see that powder turn shiney...so much fun! Well I've been having a blast with embossing this week so I thought this would be the perfect challenge! For today's card I stamped a leaf image from the Seasons of Change stamp set onto cream cardstock in Old Olive Distress Ink (to keep the ink wet longer, I first stamp in VersaMark ink and then in the distress ink). I heat embossed using clear embossing powder. I then covered the entire piece of cardstock with Distress Stain (More Mustard). If you haven't tried Distress Stain yet...you must! Fun stuff! After a quick heat set I misted on a bit of gold Glimmer Mist. Adds just a tiny bit of sparkle. 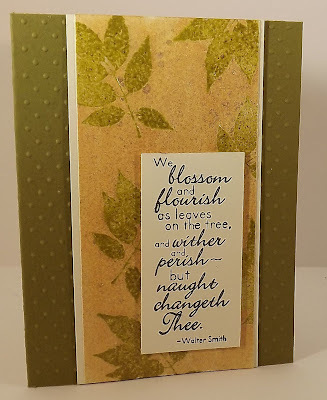 Then I mounted my leaves on cream cardstock and added the sentiment. Sweet! Head over to Splitcoast and check out the challenge...and then play along!! The one thing I did create last week was a card for the Splitcoast CAS challenge. I figured creating a CAS card wouldn't exhaust me too much! LOL! Last week's challenge was to create a card following a sketch. 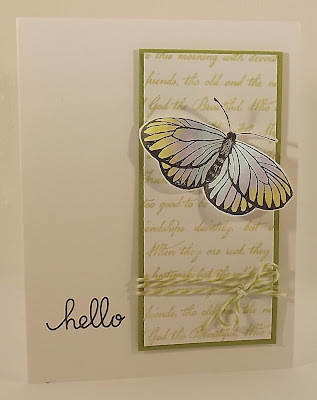 I opted to keep my card white and just highlight this pretty butterfly image from the Everyday Miracles set from Sweet 'n Sassy. I also used the Friendship Script stamp for the background. I wanted to keep the colors very soft so I colored the butterfly with pale Copic makers, used a pale green for the script, and only added a bit of green twine (also from Sweet 'n Sassy) to the panel. 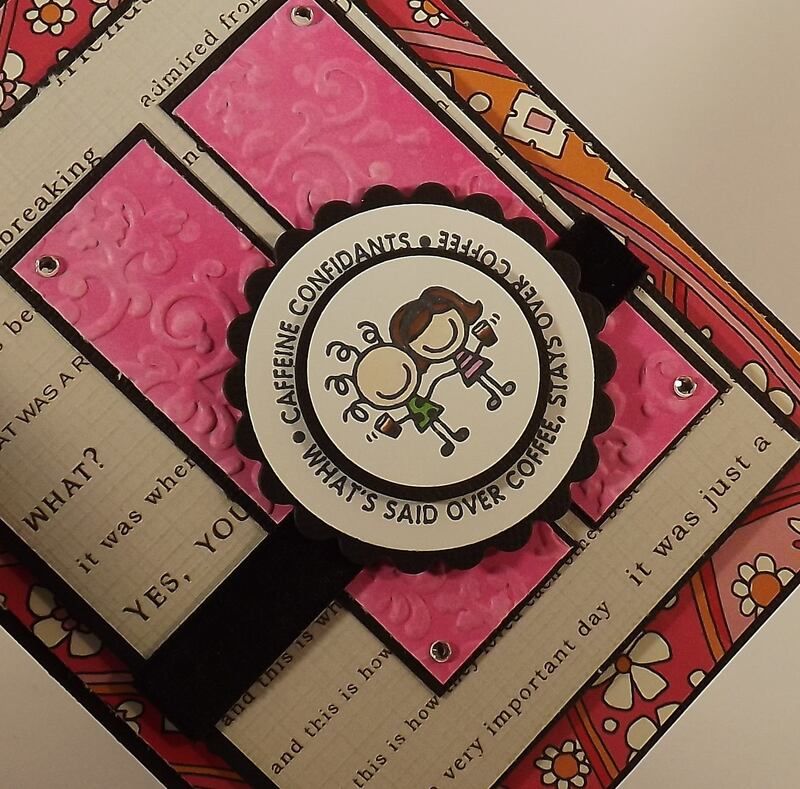 The hello sentiment is from Paper Smooches Stamps. So I have a nice, clean studio and my desire to craft the day away has returned! I'm looking forward to getting back into a more regular routine! So I've been thinking about this post for awhile now...A post where I share a fun card based upon a card that someone else created! Ohhh...is it scandelous? *smile* I've read a lot on blogs in the past about people's work being copied and while I know some of that exists (where someone literally copies someone else's work and passes it off as their own). However, I also believe that 1) it can be very easy to unknowingly create a card that is very similar to someone else's 2) when we post our work online, it's hard to try and make sure no one else copies it 3) inspiring someone else is a wonderful thing! **Note** This has nothing to do with copying someone's designs, e.g. a stamp designer, that's a voilation of copywrite laws. I'm strictly talking about card/scrapbook layouts. I have only one request when it comes to my creations...just don't submit an exact copy of my card for publication. Want to re-create a card and use it to teach a class? Go for it! Want to re-create a card and post it on your blog? Have fun! If someone wants to copy what I made? That makes me blush! Really??!! But I wonder if others have a similar view towards these things? What do you say? I sometimes struggle to share cards that I've created inspired by someone else's designs because I wonder if there will be some backlash (perhaps not enough people read my blog to even know! LOL!) or accusation of "copying." Humm...Well today's card was inspired by this card, which was been posted on the Hero Arts blog a few months ago (PS - The Hero Arts blog is full of inspiration!) I loved the display of multi-colored ribbons and was inspired to create something similar and this is what I came up with! I really like the different colors of ribbon on the white background. The sentiment is from Paper Smooches. So...what are your thoughts on being inspired and creating based on work that you find on another blog, in a magazine, or online gallery? Since it feels so much like summer this week in New England (seriously, over 80 degrees tomorrow??!! 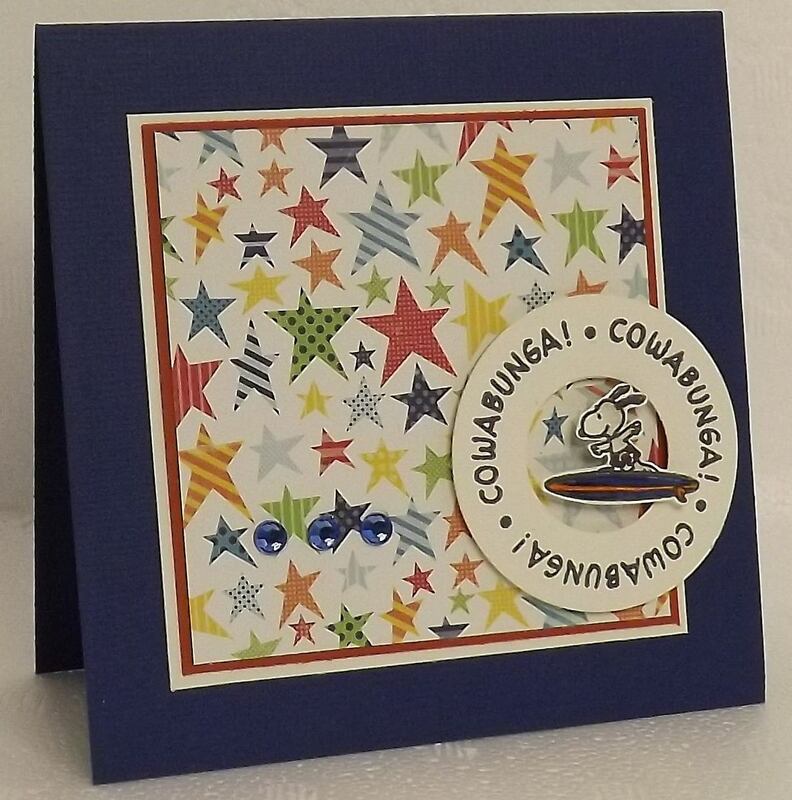 ), I thought I'd share a fun summer-themed card, featuring stamps from PSA Essentials. 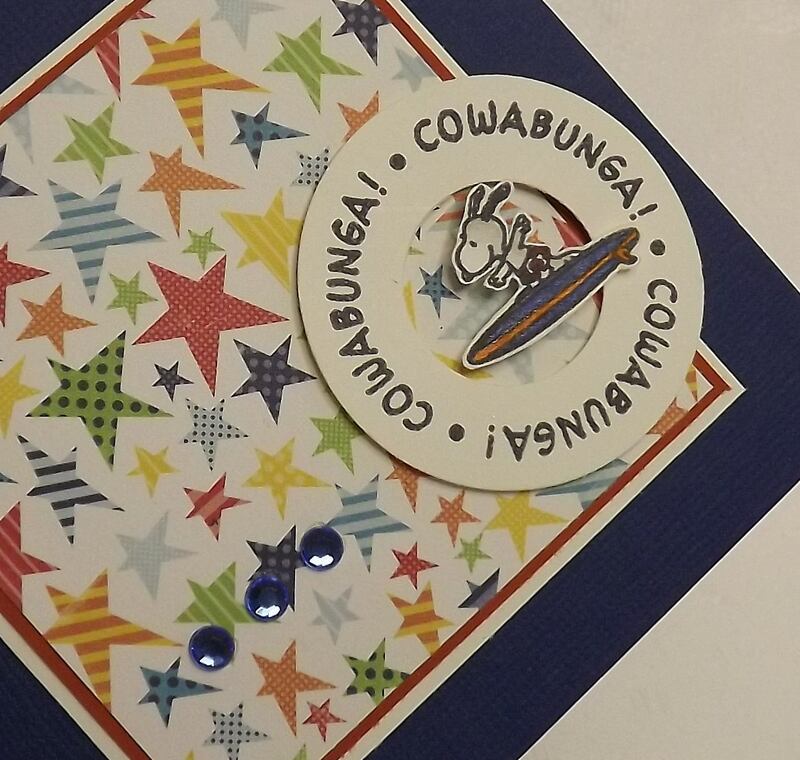 I used two plain circle Nestibilities to create the Cowabunga ring and the colored Snoopy with Copics, cut him out, and adhered him with foam tape. The fun star paper is from a random paper pack and the three blue rhinestones (quickly becoming my "trade mark" 'cause I love them so much!) are from KaiserCraft. Enjoy and if you're on the East Coast, get out there and enjoy the weather today! 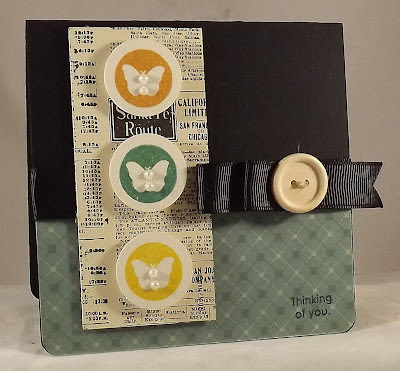 Hi everyone and welcome to today's blog hop, featuring stamps from PSA Essentials and markers from Twin Touch Markers!! We have a great hop lined up for you, full of delightful projects, and an opportunity for you to win a list of amazing prizes! You should have come here from Dina Kowl's blog. If not, then you may want to go back to the beginning of the hop by click on the Twin Touch Markers link above. The prize package during this hop is for two PSA Essentials Peel & Stick stamp sets and 1 PSA Stamper (a $50 retail value) and six Twin Touch Markers (also a $50 retail value). The link to enter is at the bottom of the post. And now for today's card! I'm already in love with PSA Essentials stamps (and these little girlie sets with the fun sayings are my favorite!) but had never tried Twin Touch Markers. I was so excited to receive a package from Twin Touch in the mail and ran straight to my studio to start playing! They were wonderful to color with and I had a lot of fun just doodling patterns with them and seeing how they blend. Overall, an A plus! To highlight the use of the marker, I actually colored a piece of cardstock with the bold pink color. Once that was dry I used the colorless blender tool to make tiny dots all over the paper. (You can see the dots if you look closely) But then...I decided I really wanted to add some texture to the two pieces so I ran them through my Big Shot using a Sizzix embossing folder. And I loved the result! Because the paper had been so saturated with the maker color, the white core of the paper came through just a tiny bit from the embossing. It gave it a nice worn look, swoon. Then I decorated my card with some fun paper from Anna Griffin and Momenta. I also used the markers to color the PSA Essentials image. 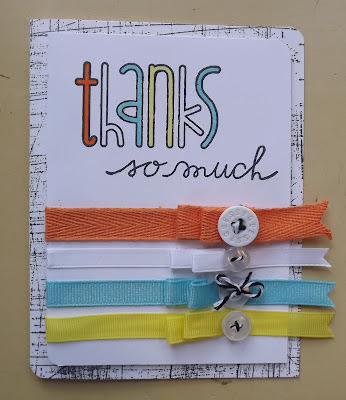 I hope you enjoy the card and now...you should head on over to Jennifer Holmes blog! But first, don't forget to enter the contest by clicking on the link at the end of the blog participants list. Enjoy!! Kim Schofield - You're here! Oh, I should also mention that PSA Essentials has an exclusive discount for blog hoppers at Cyber Savvy Shop. 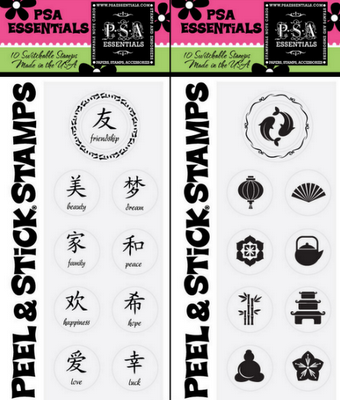 Receive 30% off all Peel & Stick packs and custom stamps are $26.50 (regularly $40.) Shipping is just $6.00 for orders over $50, and free for orders over $100. And the main site for Shinhan Art Materials can be found here. Link below! Hey kids!! Sorry that I've been MIA lately...my family was out of town for two days and I didn't have an opportunity to pre-post before we left. It's been far too busy lately...I didn't even have time to create a single thing last week! That hasn't happened in a very long time!! And this week is proving to be just as busy so I'm hoping to grab a few minutes to stamp before the weekend. 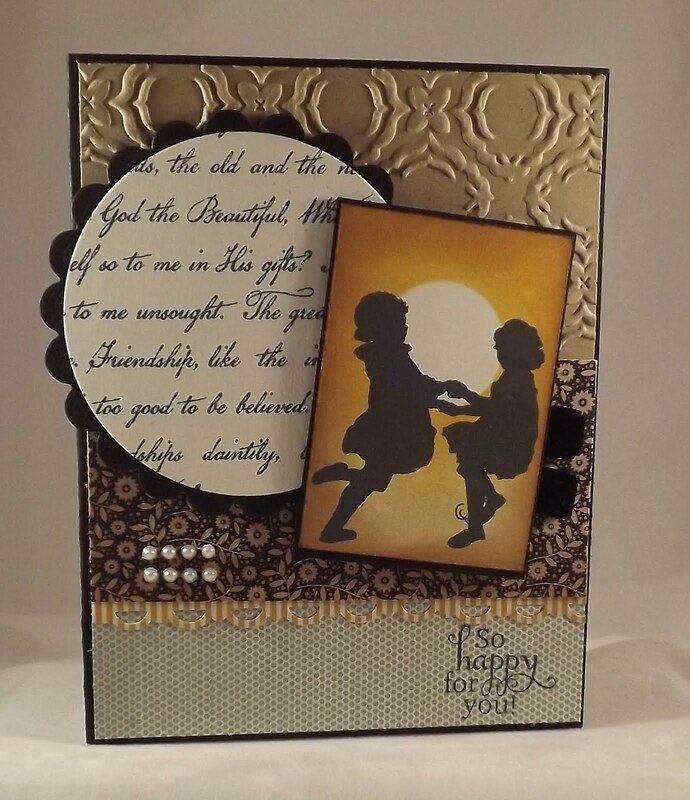 I will be participating in a joint blog hop on March 18 for PSA Essentials stamps and Touch Twin Markers so be sure to check back on the 18th!! 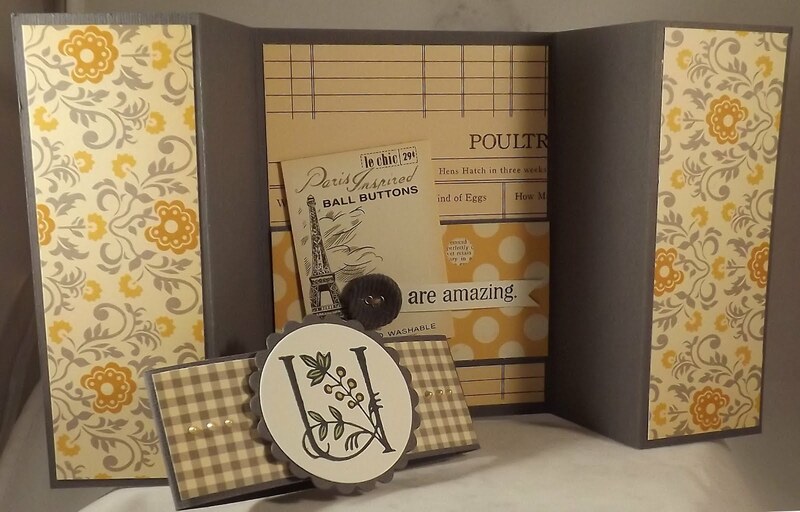 Today's project features a great stamp set from Sweet 'n Sassy, You. (Isn't that a fun name for a set, just a single word?!) This set features the fun, stylized letter "U" (two of them actually!) 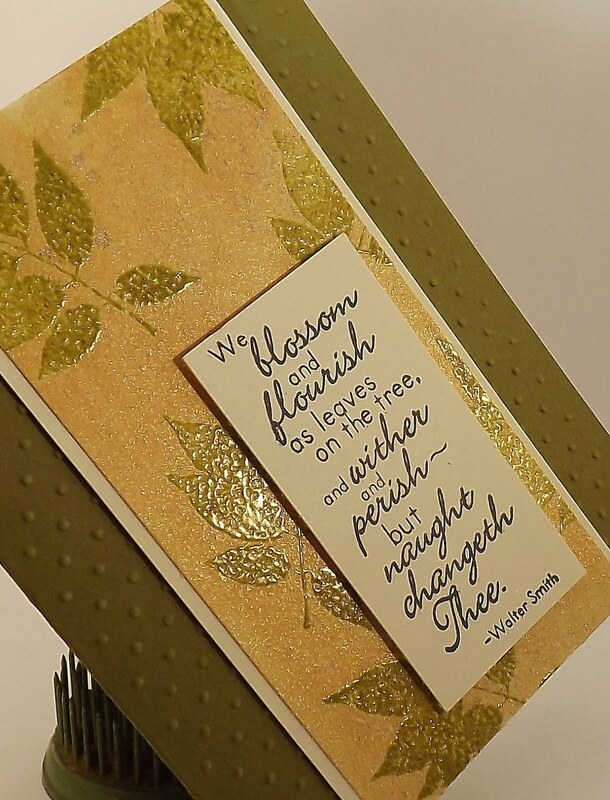 and a whole bunch of coordinating sentiments, such as the one I used on today's card, "are amazing." This is a card I created for a Wholly Scrap! class, where we focused on creating cards with non-traditional folds. This is called the Double Z Fold card and you can find the super easy directions here on SCS. I used my recent favorite designer paper, Farmhouse from October Afternoon, on this card (I'll try to stop using this paper soon but seriously...I adore it!) and even managed to work in one of the tiny ATCs (on the inside of the card) that came with the OA paper pack. 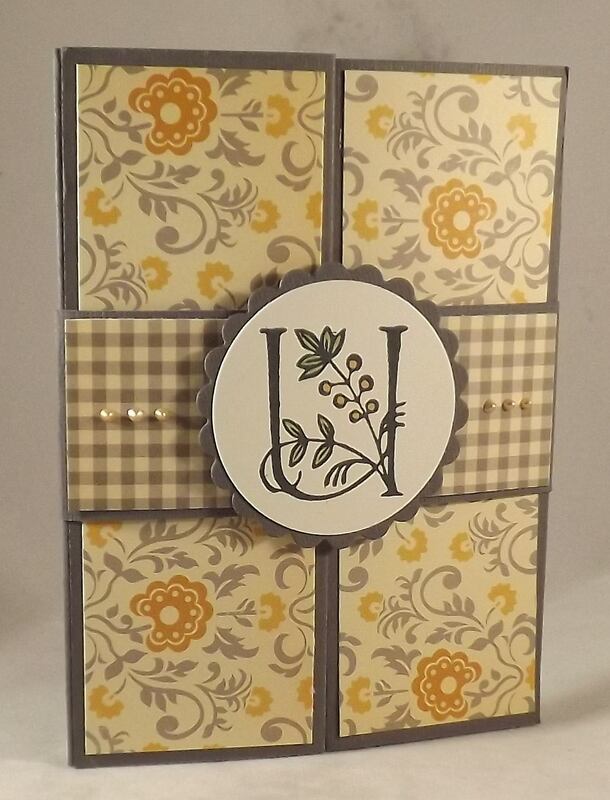 I really liked using a band around the card to keep it closed, verus a ribbon, and the "U" was a perfect centerpiece for the front. 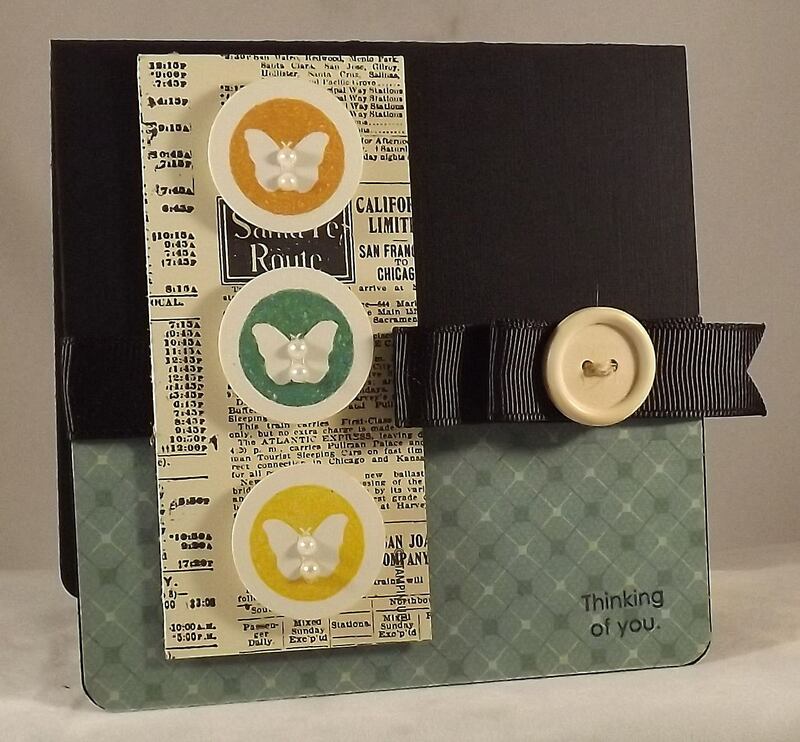 I just added a grey fabric button and the sentiment to the inside to finish the card. Enjoy and don't forget to stop by on the 18th! Welcome to the weekend! Anyone have any exciting plans for today? Today is my oldest's birthday and we'll be celebrating eight wonderful years!! Can't believe he is already eight! Goodness, the time goes by quickly!! Well before I head off to eat cake, let's take a peek at today's card that features the Seeing Spots stamp set from Sweet 'n Sassy. This is such a versatile set, with images that are perfect for all kinds of events and even ones that can be used for backgrounds! There are even a boatload of sentiments too! One of my favorite images, no surprise, is the butterfly! For this card I stamped three butterflies in three opposite colors and used a 1" punch to cut them out. I also used tiny pearls as bodies and attached them to the card with foam tape. 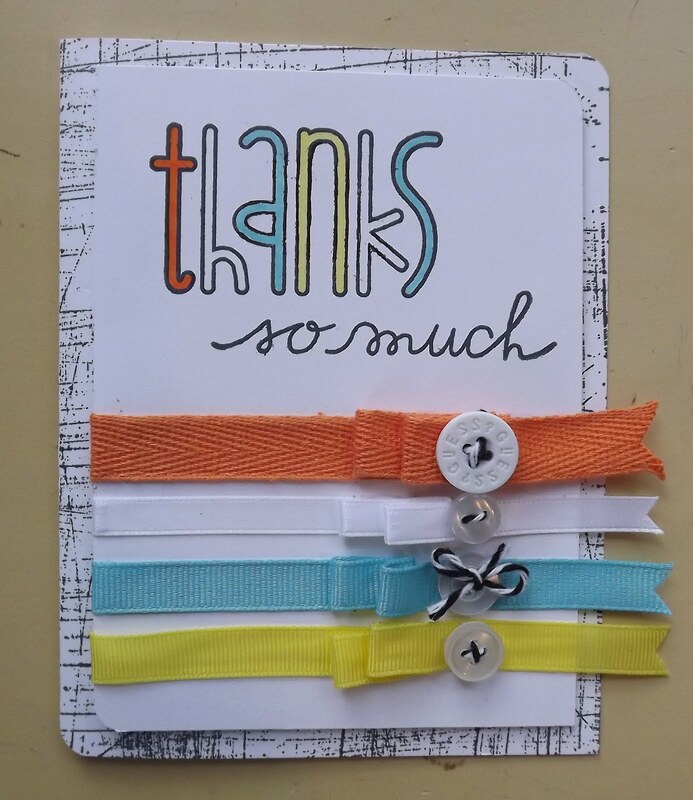 The paper at the bottom of the card is from We R Memory Keepers and the newsprint is from Stampin' Up! Ribbon is from Papertrey and the button is a fun wooden one that I found at Michael's for a bit 'ol dollar! Enjoy your weekend and eat some cake in honor of our birthday party! Hi there friends! 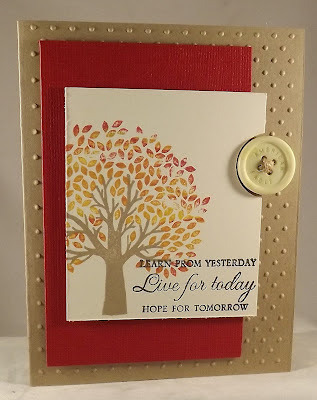 Sharing a quick card today that I created for a class at Wholly Scrap! This fun card features these great heart die cuts from Sweet 'n Sassy. I used a text background stamp, just barely visible, on the entire card surface and then popped up three hearts. I used foam tape in two different sizes so that I have three levels of hearts...fun stuff! I then added a piece of this great pink ribbon to the edge. The inside of the card features some heart paper!! Perfect for the love of your life!! Enjoy! Hi there everyone and happy Tuesday! Today I'm sharing a card that I created a few weeks ago. This was for a CAS challenge, to create a card with a nature them and that offered a word of encouragement. I opted to go with this great tree image from Papertreyink. (I'm also partial to the great sentiment!) 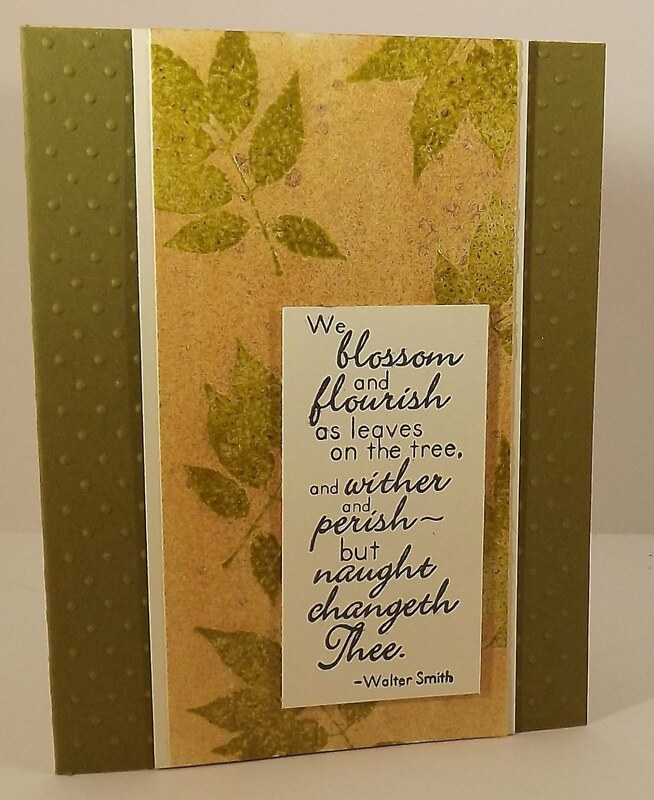 For the leaves I used three different Distress Inks to create the multiple colors. The sentiment just went over a portion of the tree in black ink and I punched out a half circle for a spot to hold my button (also from PTI). 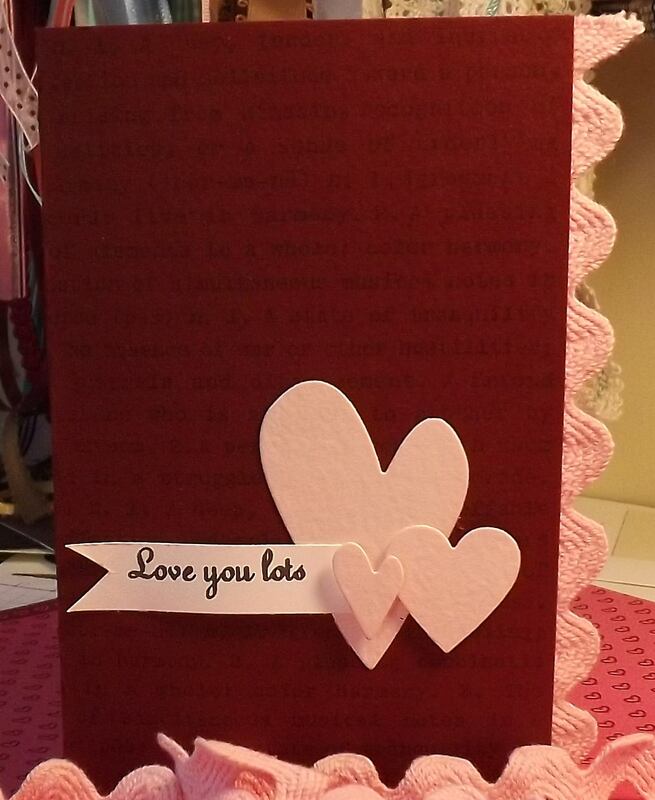 The background of the card was embossed with a Sizzix embossing folder. Enjoy! Did you kids have an opportunity to attend the Sweet 'n Sassy Release Party on Thursday night? Oh, we had so much fun!! Great stories were shared, amazing card samples, oodles of new stamps, and three wonderful challenges! (I even managed to get a card created during the release, which I'll share next week!) If you missed the party this month, be sure to mark your calendar for April 1 so you can attend the next release! 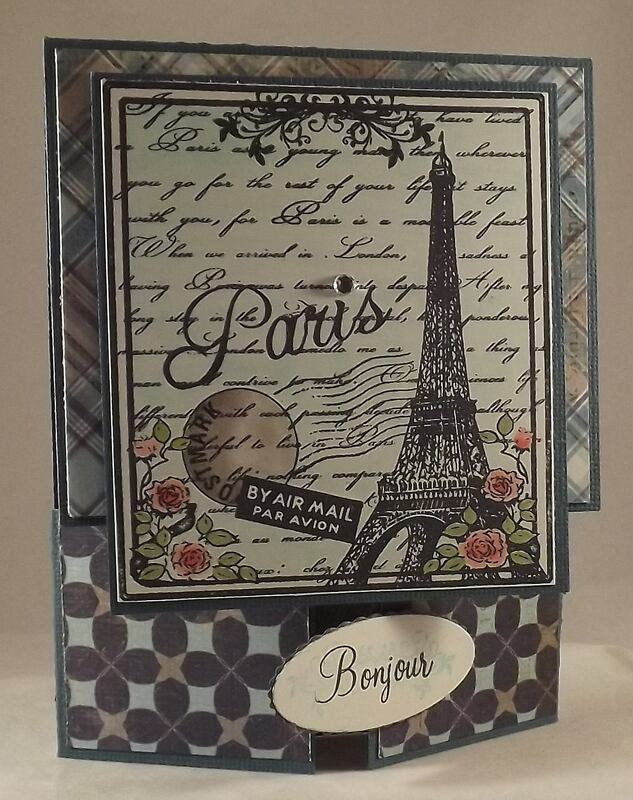 Today's card features the new set, To Paris With Love. Isn't this a beautiful image? So many possibilities! 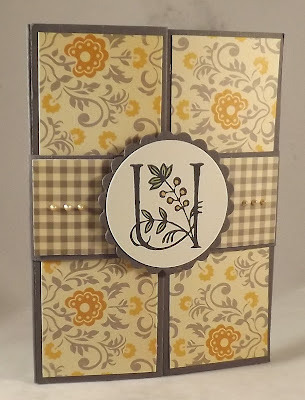 This is a card I created for an upcoming Wholly Scrap! class where we'll create cards featuring fun and unique folds. This is called the Double Dutch fold and you can learn all about it here on Splitcoast. The size of this image is just perfect for this type of card since you need a larger image for the front, to hold the little flaps at the bottom closed. I colored the background with a very pale blue and then added just a pop of coloring by coloring the flowers. The paper is from Echo Park and is actually a little boy-themed paper but I just adore the grey and patterns found on the opposite side of the paper. Be sure to stop by the Sweet 'n Sassy web site to check out all of the amazing new sets!! Enjoy! Welcome to the Sweet 'n Sassy Stamps March New Release Celebration! 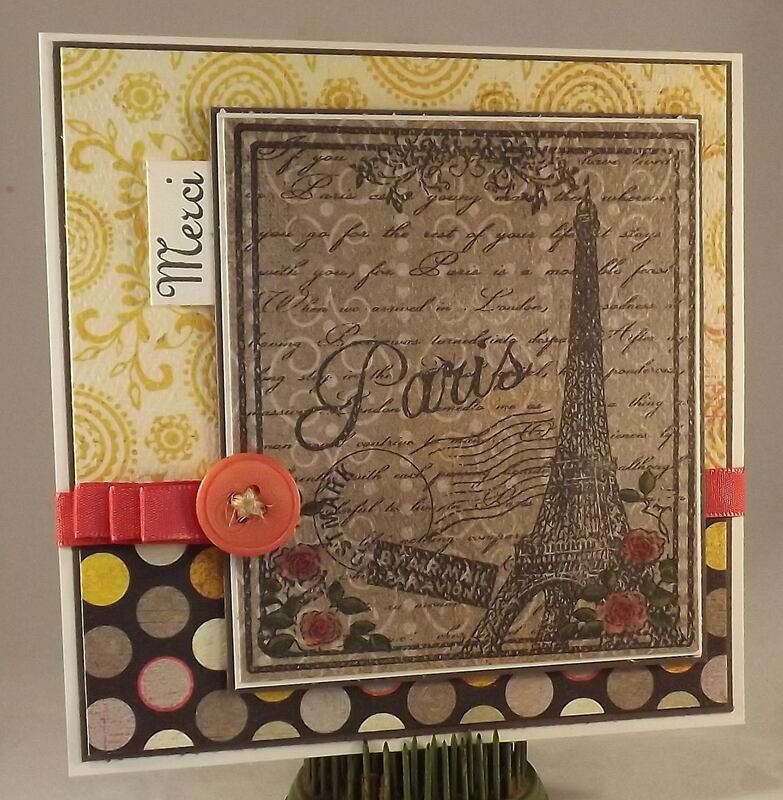 The Design Divas are so excited to be kicking off this month's amazing stamp release with a blog hop today. 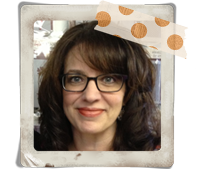 You are probably joining me from Monika Davis's blog; if not, be sure to head back to the Sweet 'n Sassy Stamps blog so you don't miss a thing! I am ga-ga for this month's release, filled with so much goodness! 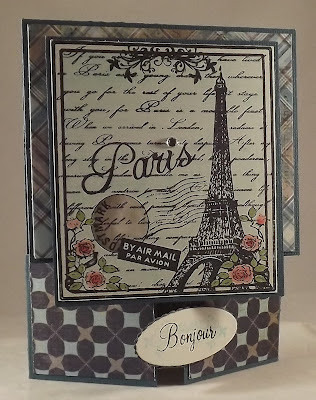 My cards feature the Friendship Script background stamp (seen directly above) and the To Paris With Love set (on first card). 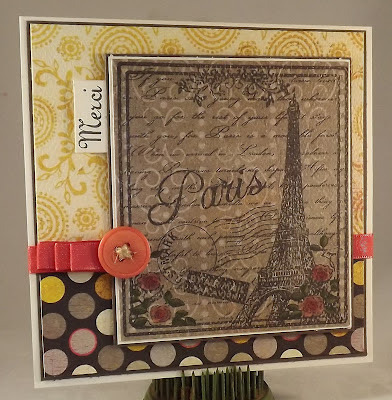 The Paris card features beautiful paper from My Minds Eye and I opted to keep stamp the entire image on to designer paper and only color the flowers. I'm liking that look! On the second card I also used the Together Silhouettes stamp set and paired both sets with more vintage paper from My Minds Eye and a design from an embossing folder. After the hop, make plans to join us for our New Release Party over in our Member Company Forums on Splitcoaststampers. We'll have full reveals of all the stamp and dies sets being released this month, challenges to inspire you, and of course fun chatter with great friends! See you there!